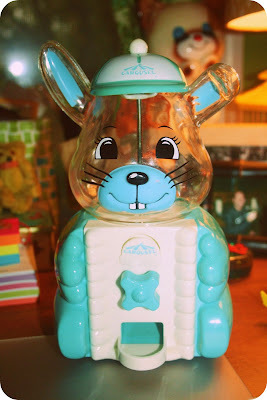 Last week while looking for cute vintage bunnies on Ebay - I discovered this cute bunny gumball machine. I watched it for a few days and when no one seemed to be interested in it, I snatched it up for only $8.00 USD. When I received it this afternoon, I quickly went shopping online for gumballs. If you've ever shopped for candy online you'll know it's very tempting. My "Candy Warehouse" cart is currently holding gumballs for my type of machine and some swedish fish and some pixie sticks for the Shop.